On Ash Wednesday, February 25, 2004, a revolution hit the box offices in America, the Mel Gibson movie, ‘The Passion of The Christ’. Preceded by an emotional and vitriolic firestorm in the national and international media, within the first twenty days, “The Passion” claimed its role among the all-time top 25 domestic blockbusters. “The Passion” quickly overshadowed the most successful religious movie on the life of Jesus, Martin Scorsese’s “The Last Temptation of Christ”, which starred Willem Dafoe portraying a reluctant Messiah which fizzled at $US8 million earnings, the most successful independent movie, “My Bid Fat Greek Wedding” and then going on to topple the highest grossing R-rated movie of all time, Matrix Reloaded with gross earnings of $US281 million. While the initial firestorm has centered on the bloodiest and goriest ‘superman’ image of Jesus or the anti-Semitism depictions of the Jews in the movie, very little discussion has centered around; what is the psychological impact of “The Passion” on the international population? What is the discussion as the world is heading towards a global economy and advocates of world government narrow their global geo-political focus on Jerusalem? What is the spiritual impact on the ever strident discussions on the humanness of Jesus verses the deity of Jesus? Can the movie move beyond the suffering image of a super-man which no human can emulate and the “Suffering Servant” of a God-man whose skin is gouged out by beatings and torture? Overall a majority of the written comments of the American media on the effect of “The Passion” on the American public were initially positive. Yet in private conversations many express reservations or emotional conflicts of aroused passions that are subterranean and latent. As we watch carefully the trends, more and more reservations are being aroused about thoughtful and sensitive Christian writers. Yet we must ask how will the European or the Middle Eastern populations respond to the movie? 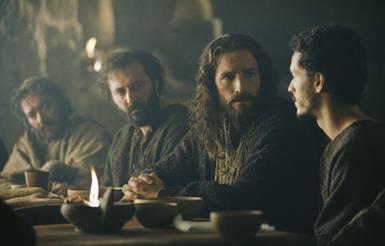 A movie, stripped of its message of hope and love that is part and parcel of the historical ministry of Jesus and the portrayal of the Risen Christ with its images of salvation, redemption, resurrection and glorification, devotes itself to the basest of emotions; terror, fear, power, greed, and control. 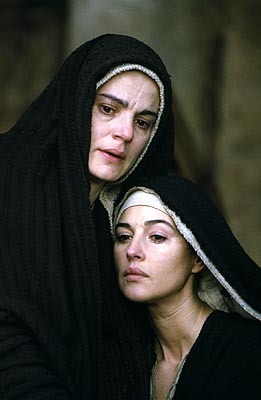 The first part of “The Passion” that impressed me was the reality of the movie set in a context of Roman Judea. The two hours of Aramaic and in specific the Eastern dialect of the Aramaic language with a scattering of Hebrew and Latin, though not understood by a majority of the audiences, instills a psychic imprint that will not be erased; Jesus was a Jew and that His life was as a Jewish Rabbi, living in a Jewish culture. It only points only to a further fact that we must understand him not as a Christian but only within the Hebrew-Judaic roots of the Christian faith. What was missing is the lack of context with the life and times of Jewish society in the midst of preparing for the Passover during the Feast of Unleavened Bread. The death of Jesus was not a Christian event, it was a Jewish event. The death of Jesus was not as much as a human event as it was a Divine event. It was not the martyrdom of a super-human as much as it was a triumph of God that assaulted the bastions of Satan and shattered the foundations of hell. The clutches of sin were forever broken. The Great Controversy between God and Satan which depicted Satan assaulting the heavenly dominions of God was now to be refocused on the recovery, redemption and restoration of those that had fallen to the power of evil, self-centered, and the obsession for power, and control over all of God’s creation; humans, animals, birds, plants and the land that He created and pronounced “very good”. We must understand that the historical context of the death and resurrection of Yahshua was not a Christian Easter holiday but a Jewish Passover-First fruits festival. To understand the purpose of the death of Jesus could only then and now be understood in the context of the Passover festival in which it was enacted. The blood that came from the death of the Pesach (Passover) Lamb saved the first born children of Israel in Egypt from the death angel, so also the living anti-type, the blood of Yahshua as the real Pesach Lamb sealed forever the destiny of man. It saved him then and now from the “Egyptian oppression” that controls each of us. After the death of Yahshua, man now had the security that by his choice He is separated (sanctified) and redeemed from the Satanic clutches of sin. As the human Yahshua separated Himself from the power, greed and control systems of the Roman Judean society around Him and followed solely the will of His Father, He became a type for us today to separate ourselves from our society as we follow solely the will of Jesus. Jesus never did renounce His Jewishness. He did come to restore the corruption of how Torah (Law of Moses) was observed and lived in His Jewish world. He did come so that the literal “Lost Sheep of the House of Israel” could be restored back to the brother relationship with the House of Judah. He did come so that all mankind, Jew, Israelite and Gentile, through Him could be restored back to a family relationship with His Father. The life of Jesus can only be understood if it remains central to a Jewish debate about the life of a Jewish Messiah that was prophesied by the Jewish prophets. Even beyond is that enshrined in the life of Yahshua is a complete drama cast in the shadow pictures and min-dramas of the Jewish festival of the Lord. Throughout Passion week, everything that the Passover Lamb was doing, Jesus as the Pesach Lamb also reenacted. Whereas “The Passion” depicts Caiphas the high priest as being there every minute of Jesus’ trial in Caiphas’ home, the Sanhedrin in the Chamber of Hewn Stones near the temple, the Praetorium of Pilate, and on the hillside watching the crucifixion, the Biblical picture shows a different story. As the Pesach Lamb was taken to the temple to be inspected and observed so that the lamb could be declared unblemished. So also Yahshua was interrogated and inspected by the Pharisees and scribes, while He demonstrated the real ‘kingdom of God’ as He healed and taught the multitudes in the courtyard of the temple for three days. Yes, Jesus did have control of the temple for the temple leaders “feared the people because they took Him for a prophet” (Matthew 21:46). 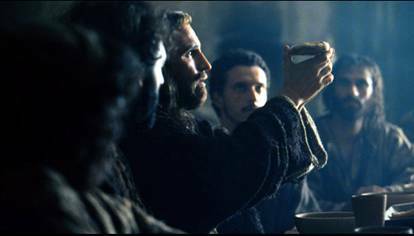 When the high priest, Caiphas, proclaimed that the Pesach Lamb was perfect and unblemished, Yahshua was being interrogated and inspected by the Procurator Pilate, who then proclaimed, “I find no fault in Him”. By understanding the crucifixion of Jesus with all the shadow-pictures of the Hebrews, we see Jesus as the fulfillment of the sacrifice of the ‘red heifer’. The holiest of all the sin offerings using a young bullock was the sin offering of the Red Heifer. The red heifer, offered as a sin offering for purification of the collective congregation of Israel was slaughtered according to the dictates of the Lord of hosts to Moses outside the camp of Israel. (Numbers 19:3) Unlike the other sin offerings, the Red Heifer was walked over to the Altar on the Mount of Olives (outside the camp of Israel/Jerusalem) and there burnt in its entirety. The difference of the red heifer and the other sin offerings was that the other three were absolving sin, giving the recipient freedom from sin or in a sense, salvation. On the other hand, the ash of the red heifer was to bring purification and holiness. The blood of the red heifer was sprinkled outside the camp, the body burned to ashes, and then the ashes through some mystical process that transcended even the wisdom of Solomon, when it was mixed with pure spring water bestowed holiness and purification as its was sprinkled over not only people, but over the land. They purified the temple with it. They could purify the entire city of Jerusalem if needed or the entire Land of Israel. After the death and resurrection of Jesus, our way to holiness would come only through the sacrifice and blood of Yahshua, the Son of God. It was Jesus, who was sacrificed as a ‘sin offering’ not only to bring holiness for his brethren the Jews and the “Lost Sheep of the House of Israel” but to all people. It was they, who by belief in the sacrifice of the blood of Yahshua are “adopted” and “grafted” into the literal and spiritual House of Israel. During the special ceremony of slaughtering the red heifer, we need to be reminded that this occurred only nine times between Sinai and the destruction of the temple in 70 CE. The red heifer was led out of the eastern gate, cross over the doubled tiered arched bridge called the Bridge of the Red Heifer, to the Mount of Olives and led up to an altar near the summit of the Mount of Olives. (Middoth 1:3; 2:4; Yoma 7:2 plus the Talmud in Yoma 68a and Zebahim 105b). Here on this altar called the Miphkad (Appointed) Altar, the ceremony of preparing and burning the red heifer was performed. Let us note the words of the author of the Book of Hebrews in the reNewed Testament of the Brit Hadassah. Consider now the entire scene of the trial and crucifixion of Jesus. Jesus was condemned and died just before a High Shabbat (Sabbath of the festival Passover), was judged and condemned in the Chamber of Hewn Stones in His Father’s House and in the presence of God, His Father. As Adam was cast out of the Garden to the east, so also Jesus, accursed and condemned, was led out the Eastern Gate away from the presence of His Father. 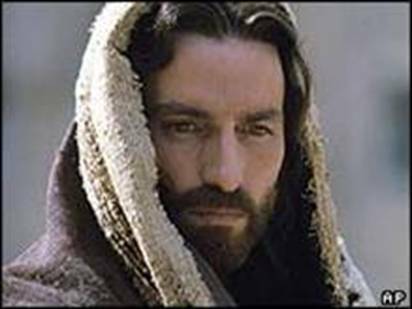 The second part of “The Passion” that impressed me was the lack of understanding not in the super-human character of the actor for Jesus, Jim Caviezel, but in the nature as a human nature of the Tzaddik or Righteous One, that Yahshua lived on this earth. It was the Apostle Paul who understood best the inter-dimensional role of the death of Jesus, His life as a righteous man (tzaddik) on earth, and the role of the Anointed Moshiach (Messiah) who would return again as a Savior to recover the remnant of His people who are surrounded by the demonic forces of evil at Armageddon. It was this Tzaddik/Moshiach, who would sit on the right hand of the throne of His Father. Did not Paul state? Romans 5:16 – “Therefore, as through one man’s offense (Adam at Eden), judgment came to all men, resulting in condemnation, even so through one Man’s righteous act (Yahshua as the Second Adam) the free gift came to all men, resulting in justification of life. For as by one man’s disobedience (Adam) many were made sinners, so also by one Man’s obedience (Jesus) many will be made righteous. 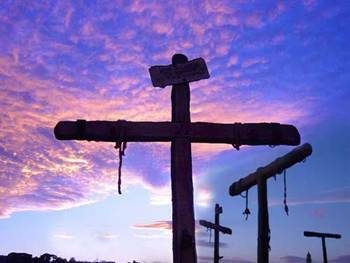 Yahshua went to the cross as a righteous man (tzaddik) is accepted by all, but many fail to comprehend that it was Jesus’ righteousness which came by implicit obedience to His Father Will, moment by moment throughout His life, that made His sacrifice complete. Did not Pilate’s wife accept that Jesus was a tzaddik when she said, “Have nothing to do with that just (tzaddik) Man, for I have suffered many things today in a dream because of Him”? (Matthew 27:19) Did not the Roman Centurion say as Yahshua died on the stake, “Certainly this was a righteous (tzaddik) Man!”? (Luke 23:47) Jesus did not come here as God to accomplish something that man could not do. Rather He accomplished it as a human being in perfect obedience with His Father so that we could follow in His same footsteps. He was the living revelation of Torah and followed all the commandments of His Father given at Mount Sinai. In essence Jesus was the Living Torah, the Torah in the flesh, and the most perfect revelation of His Father. The “Passion” of Yahshua can only be understood when the Hebrew festivals, the Hebrew rituals, and the Hebrew ideas are all kept aligned with a Hebrew philosophical foundation. It is out of the matrix of this Hebrew philosophical foundation that we read this text in Isaiah about the Holy One of Israel who was the Servant of God and the Redeemer of Israel. The Drama of the Plan of Salvation given to the Hebrews at Sinai would not be understood without the context of the dramas yearly enacted by the Festivals of the Lord given at Sinai. Yahshua, who was the revealed Torah in the flesh, was now to depict in living drama the real purpose of the Passover. It was a prophetic drama that was re-enacted year after year to keep God’s chosen people sensitized with shadow pictures of the great mystery of God, that He was to send His own Son to reveal in living color and in human drama how the halachah of the Torah was to be lived. Jesus lived the life of Torah and truly was a Righteous One (Tzaddik), and the Holy One of Israel. So also we must obey like He and walk in His footsteps a life that is, moment by moment, in harmony with His Father, the God of Israel. “The Passion” has garnered a firestorm concerning the anti-Semitism of the Jews. Yet a Semite was more than a Jew. The rejection of the divine plan for the House of Judah at the time of the end may also be our rejection of the divine plan for the House of Israel who is yet to be revealed. The fact that we, each one of us, may be literal descendants of the lost House of Israel is a historical reality. The fact that each one of us is ‘grafted’ into the vine of Israel is a spiritual reality. The most potent anti-Semitism is our ignorance of the Jewishness of Jesus’ mission to the “lost Sheep of the House of Israel” and a denial that we may be literal descendants of the House of Israel. They were lost in the vast migrations of the tribes of Israel across Macedonia to Europe and America and the vast migrations across the Levant to Arabia, Persia, India and China. Any anti-Semitic beliefs may be a denial of our own reality, our own heritage, and our own destiny. The third part of “The Passion” that impressed me most was the overemphasis on brutality and the super-human strength of Jesus, with the lack of historical gospel evidence to account for it. To put the life of Jesus in a context that He is doing something that is super-human or non-human reduces the role of all of us to seek our Savior. As such, we do not feel responsibility to act in obedience to God the Father. The temple did have a security force under the direction of the high priest to be used for civil order and crowd control. The presence of Roman soldiers anywhere near the temple compound with the Roman ensigns had more than once caused protests, massive riots, and hundreds of deaths of the Jews. These temple guards, which no doubt included the “servants of the high priest” Caiphas and his powerful father-in-law, Ananus the Elder, were used, as recorded in Josephus, as armed mercenaries to oppress their own people. It was they who were sent to capture Jesus and bring Him to the temple authorities. This act was done in the presence of a paid informant, Judas Iscariot, the treasurer of Jesus’ own inner circle of twelve. The gospel does not give any other testimony of brutality or beatings until He arrived at the residence of the high priest, Caiphas and “they all condemned Him to be deserving of death.” (Mark 14:64) There was no throwing over a bridge with heavy-duty chains with enough trauma and contusions to sustain fractured ribs or crushed vertebras. There were no floggings while in route to Caiphas home for they had not questioned him to determine a reason for either confinement or death. It was in this courtyard, a non-official court trial was conducted by the “chief priests, the elders, and the scribes” (Mark 14:53). There they sought to find “testimony against Jesus to put Him to death”, but found none. Jesus throughout His life remained in full obedience not only to Torah law, Jewish civil law, and Roman law but He also showed even proper respect for the Caesar. In the words of George M. Lamsa in Gospel Light we seek greater understanding of this event within the culture of the Middle East. George Lamsa – “Jesus was condemned for the blasphemy of making Himself equal to God. When a man was condemned for a crime or blasphemy, everybody spat on his face, signifying they had no part in his guilt and actions. Still what we see was not a lynching, nor a mobbing or a scourging. Neither was Jesus stoned because since Yahshua was a Galilean, He was under the jurisdiction of Herod. The Judeans were not allowed to stone anyone outside of their jurisdiction. Mark 15:15-20 – “And he (Pilate) delivered Jesus, after he had scourged Him, to be crucified. Then the soldiers led Him away into the hall called Praetorium, and they called together the whole garrison. And they clothed Him with purple, and they twisted a crown of thorns, put it on His head, and began to salute Him, “Hail, king of the Jews!” They struck Him on the head with a reed and spat on Him; and bowing the knee, they worshipped Him. And when they had mocked Him they took the purple off Him and His own clothes on Him and led Him out to crucify Him. Does this scriptural account suggest that Jesus’ tunic was shredded and matted in blood? The evidence suggests otherwise. Here was a finely woven tunic that was worn by noted rabbis or Tzaddiks in Israel. It was the outer mantle of a righteous man which carried the power or divine energy that flowed through their body. When the priests wore a fine linen tunic it was to be a spiritual atonement for accidental killing or intentional murder. I doubt that there was any motivation to “cast lots” for a shredded piece of garment matted with blood. Here were the Roman solders who used their upper body to create literal acts of homicide and genocide and to create an atmosphere of fear and oppression. Yet, now they were casting lots for the garment that could atone for their sins. Is there any meaning to an understanding of the symbol and shadow pictures that surrounded the death and resurrection of Jesus? I believe so. The Lord of hosts used the shadow pictures of the Festivals of the Lord to portray the drama of the exile and restoration of the children of Israel. It will be this same role that will bring restoration and redemption for all mankind in the final drama at the time of the end. The death and resurrection of Yahshua was a fulfillment of several typologies that portrayed the role of the Anointed One of Israel. The death and resurrection of Christ was a new prophetic drama of the saint, whether Jew or Gentile, who at the time of the end will follow their Lord through death and resurrection. Conceptual understanding of the Spring Festivals gave the Jews a visual mini-drama of the life and ministry of the Son of God in which the Father would send them. The temple service had become a commercial enterprise of power, greed and control by Sadducean families that bought the office of the High Priest from the governor of Rome. This suggests that Jesus had every right to assault the bastion of evil and corruption as a “den of thieves”. Yahshua was truly being about His Father’s business. The fact that the death of Jesus was portrayed and prophetically foretold in the Passover services suggests that with its fulfillment a new prophetic role was being instituted. The festivals were never intended to be abandoned. Just like the Passover looked back upon the redemption and Exodus from Egypt, it also looked forward to the redemption from sin by Jesus. So also the Passover death and resurrection of Jesus looks forward to the death of the old and carnal man and the resurrection to a new life literally and spiritual in Christ. How does this affect “The Passion of The Christ”? Is there a reason the Lord of hosts has allowed this movie to be produced? And why now? Many have applauded Gibson for portraying Jesus not as a wimp but as an intentionally driven man to do the will of His Father in spite of the persecution. Yet, on the surface it is a portrayal of the crucifixion of Jesus not as we have seen by the Hebrew types and symbols from which it occurred. In the coming tribulation, all opinions will soon be reduced to two: God’s view of Jesus His Son and Satan’s view of Jesus. Evil will not be cloaked in laughing demonic children, witches, and neutered images with piercing eyes prowling amongst the masses. Evil will be cloaked with images as “Angels of light” who will deceive the very elect. Up to “The Passion”, the world’s view of Jesus has been eclectic, mosaic, and altered by many centuries of cultural adaptations and societal passions. Today we are on the verge of seeing a “Global Jesus” that is still divorced from its Jewish roots and the panorama of God’s Plan of Salvation portrayed in the festivals of the Lord. 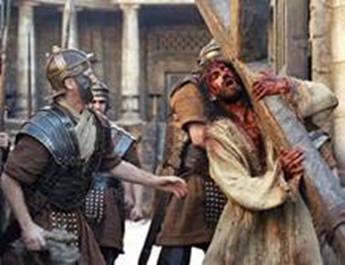 Mel Gibson’s, “The Passion”, as many authors have testified, is an updated recreation of the death of Jesus from the viewpoint of medieval orthodox Christianity as preserved and upheld by the Roman Catholic Church. This is a replay of the medieval “passion plays” where abuse after abuse was heaped upon the ‘Christ’ in the play. The Roman crucifixion was incited to its fullest manifestation by the high priest, the temple rulers, and its hoards of followers seeking to preserve their hegemony of power in institutional temple Judaism. After “The Passion” has made its international showing, and praised alike by the Pope, Arafat, and countless Christian, Arabic and international leaders, will we have succeeded to imprint in the international consciousness the Christ image of the Anti-Christ? Will we be one step forward in a homogenized religious expression that will be international in its scope? If so, then we are one step forward in seeing the coming of the real “Son of Man” who will be coming in all the power and glory invested in Him by His Father. Will we believe or reject Him when He comes? The power and emotions evoked in this movie are truly divisive. 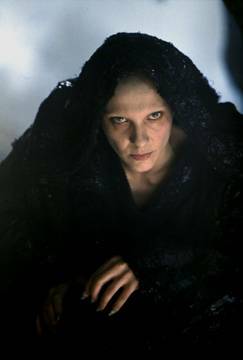 As an observer, we will affirm those parts of the movie that touch our own beliefs and suppress those parts that are alien to our belief system. Yet, the ideas and images will have been imprinted in our minds to be resurrected in a future day. With his hundreds of millions of dollars, what will Mel Gibson do next? According to public press releases, he now has the intention of re-creating on film “The War with the Maccabees”. Is it not amazing that now we will see a recreation of the Abomination of Desolation from the eyes of a globalist and an ardent follower of conservative Roman Orthodox Christianity? Are we now setting in screen drama the blue-print of how the final Abomination of Desolation will be replayed in the final years before the coming of the Messiah? Is Satan, the Master of Evil, now preparing the world for his version of the final conflict? If we truly believe that we are in the time of the end and the Lord of hosts is intervening in the history of man, then Jesus is already in the process of dividing the ‘sheep and the goats’. Those that are inherently good will become righteous and those that are evil will become fully demonic. That is the story of Revelation. Either way, we will eventually be possessed; either by Jesus or by Satan. The fact that “The Passion” provokes extremely good and extremely evil and violent passions leads this movie of becoming a two-edged sword. Is the movie anti-Semitic? Yes it is! Yet, it is not any more anti-Semitic than the world that you and I live in today. Anything that does not accept the literal and spiritual role of the chosen-ness of the House of Judah and the restoration of the House of Israel is anti-Semitic. The Jews have a chosen role to accept their own destiny is a part of the prophetic oracles of old. The fact that this chosen role of Israel is against the control of the powers of darkness that oppress our world gives us pause. There is an inter-dimensional battle for control of the hearts and minds of mankind. There is an inter-dimensional battle for control of ‘The Land’. This is the Great Controversy between Christ and Satan. Whenever the drama on earth comes close to the script of how the Lord of hosts wrote it, hell and fury descends upon our world. It so happened that the Lord of hosts chose the children of Israel to be the leading actors in this drama and with the return of the House of Jacob and the eventual House of Israel will also be the return of the Lord of hosts as He completes His role laid out from the foundation of this world. The facts also exist that the chosen habitation of the Lord of hosts is ‘The Land’ and the land is in Israel and in Jerusalem. The Lord of host states, ‘Jerusalem is Mine!” It is my assumption that we must believe it. With an acceptance of the chosennes of the House of Jacob and all of its descendants will come a new respect to the trauma and challenges of the Jewish people and the State of Israel. It does not mean we have to accept the geo-politics of the present government of Israel as they choose to develop a secular and oppressive state. It does suggest that the Nation of Israel is being “tried in the fire” first and our turn is coming. What we see going on in the State of Israel can reasonable be suggested that in the future it will be our turn. This includes daily terrorist threats and catastrophes until enough people stand up and say, “Let us follow the God of Israel as has been portrayed in the life of His son, Jesus the Messiah, who was called Yahshua (Yahshua) the Nazarene.